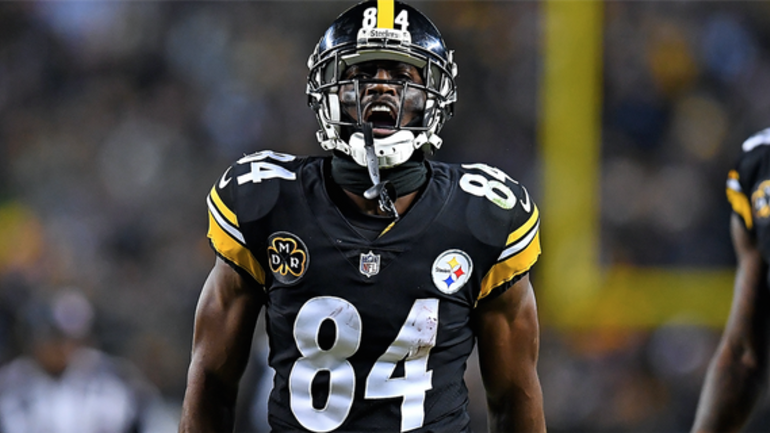 Antonio Brown has undoubtedly hurt his reputation in Pittsburgh after forcing a trade from the Steelers to the Oakland Raiders earlier this offseason. Brown hasn’t helped his eroding popularity in Pittsburgh following his recent public attacks of former teammate, JuJu Smith-Schuster. Instead of focusing on his team, Brown seems to be stuck in the past while not letting go of his ill will towards the Steelers. Despite his recent actions, Brown apparently wants to be on good terms with his former team and fan base. Included in ESPN Jeremy Fowler’s detailed story documenting Brown’s tumultuous offseason is a quote from Brown’s agent, Drew Rosenhaus, detailing how Brown’s hopeful relationship with the Steelers and Steeler Nation moving forward. Brown’s desire to remain a beloved figure in Pittsburgh shouldn’t surprise Steelers fans. Brown bought “Thank You” banners that were hung in Pittsburgh shortly following his trade to Oakland. He has also thanked Steeler Nation on numerous occasions for their love and support during his nine seasons with the organization. While the end of his tenure with the Steelers could not have been handled worse, Brown is clearly hoping that fans will eventually look past what’s recently transpired and will instead focus on the positive things that transpired during his near decade with the organization. There were certainly some unforgettable moments for Brown and the Steelers. There was Brown’s helmet grab during the 2010 postseason that helped the Steelers reach the Super Bowl for a third time in six seasons. There was Brown’s breakout season in 2011 that won him his first of four team MVP awards. There was his sensational 2015 season that saw him catch 136 passes for 1,834 yards and 10 scores despite not having Ben Roethlisberger for parts of eight games. There was his “Immaculate Extension” in 2016 that helped the Steelers defeat the Ravens on Christmas Day while clinching the AFC North division title. There was his performance in two playoff victories during the ’16 postseason that helped Pittsburgh reach the AFC Championship Game. There was also Brown’s league MVP caliber season in 2017 that helped Pittsburgh win 13 regular season games. Sadly, Brown’s great moments while wearing the black and gold have been, at least temporarily, overshadowed by what has transpired over the last several months. Brown may on day be celebrated in Pittsburgh for his achievements during his time with the Steelers, but it’s going to take a lot of time, patience, healing, and even some contrition from Brown if he is going to be cheered again inside Heinz Field at some point in the near future.